​At the turning of the New Year, it is customary to reflect on the past year and make resolutions for the year to come. So often, though, as we make plans for our lives and our futures, it is easy to overlook the hidden beginnings of much that shapes our lives. In the busyness of everyday life decisions are made, events occur, or people enter our lives. When we look back over the years, it is usually just such unnoticed moments that have the greatest effect in our lives, for good or ill. 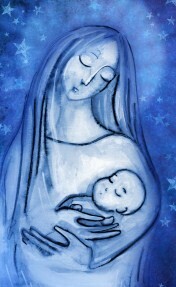 This feast of the Mother of God coincides with our secular celebration of the New Year. The readings for the day explore the beginnings of our faith. In the first reading, taken from the Book of Numbers, the passage gives the well known “Aaronic Blessing” of “Priestly Blessing” which may be even older than the written text of the Old Testament. The blessing is given by God to the priestly class or the “sons of Aaron” through Moses. The words are simple, but poetic and rich. In Jewish liturgical tradition, times of distress were seen as moments where God hid his face. By contrast, this wish that God would reveal his face is a wish for God’s presence and the blessing it brings to the faithful. The wish for shalom, is expressed inadequately in English as “peace.” The peace which God offers is restoration, all goodness, healing and reconciliation. This prayer of blessing reaches back millennia into the hidden beginnings of the people of Israel. In it, God commissions an unknown former slave to speak his blessing to the people. And that moment echoes still today as generation after generation has pronounced and heard these words of blessing and promise. In the Middle Ages, St. Francis of Assisi would adopt this ancient prayer as his own. His actions for others gave deep resonance to the words. Hidden beginnings can indeed produce distant and unexpected results. The second reading is taken from Paul’s letter to the Galatians. In his day, Paul struggled to convince all Christians that Jews and Gentile were equally invited to faith in the Lord. In places like Galatia, opponents of Paul insisted on the superiority of Jewish Christians and the need for Gentiles to accept and observe Jewish law. In response to such claims, Paul rejects the notion that physically belonging to the Jewish race has any bearing on the relationship of the believer to Christ. Instead all peoples find a new possibility of relationship to God through Jesus’ life and death. And this relationship is one of remarkable intimacy in which Jesus invites the believer to enjoy the same status and relationship to God as the Son. Today, it appears to us self evident that Jesus dies for all the nations equally. This is in large part due to Paul’s and his determined preaching. For some of those early Christians, matters were less clear. They failed to see the importance of those beginnings of faith among the Gentiles. They failed to see God’s hand at work and the potential for preaching the Gospel to every corner of the world. We are fortunate that the faithfully Jewish Christian Paul did see and act on those tenuous beginnings. The Gospel passage from Luke revisits the events of Jesus’ birth. Here too, we encounter hidden beginnings far from centers of power or wealth. At the outskirts of a provincial town, and unknown young girl has given birth. In that far province of Palestine there were many women named Mary, many boys named Jesus. The first visitors to the child are lowly shepherds who themselves lived at the edge of society. And yet there, hidden and largely unnoticed, the most important time in human history commences. Only later will the world look back and begin to understand the importance of this humble, faith filled girl and her precious child. We are told in the passage that Mary “kept all these things, reflecting on them in her heart” (2:19). In this, she gives us good example for our reflections at the New Year. In our prayer and reflection, perhaps we will find the grace to live with trust and openness to the Lord and to perceive those important beginnings hidden among the details of our lives.